My Journey Out of Food Addiction and How You Can Escape It Too! Foreword by Joel Fuhrman M.D. Emily Boller’s self-help book provides the necessary inspiration, education, and practical tips for you to escape food addiction—and in the process, shed unwanted pounds and reclaim your health. Chubby in childhood, anorexic in her teens, and then obese until age 47, Emily Boller was desperate to find freedom from her struggles with food. When she began documenting her weight loss journey online, she never expected to become an inspirational voice for food addiction recovery to millions. Starved to Obesity combines her personal journey, hard-won wisdom, and practical tips with Joel Fuhrman, M.D.’s teachings to create a powerful resource that will inspire and help you break free from entanglements that sabotage health and well-being. And, as the result of losing a child to suicide, she knows firsthand the impact of trauma and grief on addiction recovery—and how to recover from relapse as well. If you want long-term freedom, this book will show you the way! "Emily Boller's story is of enormous importance and will help many people. This is the only book on eating disorders that grasps the critical significance of the Standard American Diet as a contributing cause that correctly identifies nutritional density as an essential aspect of recovery. Starved to Obesity is foundational to true recovery and turns recovery into something attainable and natural rather than a perpetual struggle. Beautifully, magnificently done!" "Emily Boller draws upon her personal journey of tragedy to triumph to create a clear, hope-filled pathway to healing and wholeness. If you, a friend, or loved one struggle with dieting, emotional eating, weight loss, or health challenges, Starved to Obesity can change your life. It is a beacon of hope and a north star pointing the way to freedom." 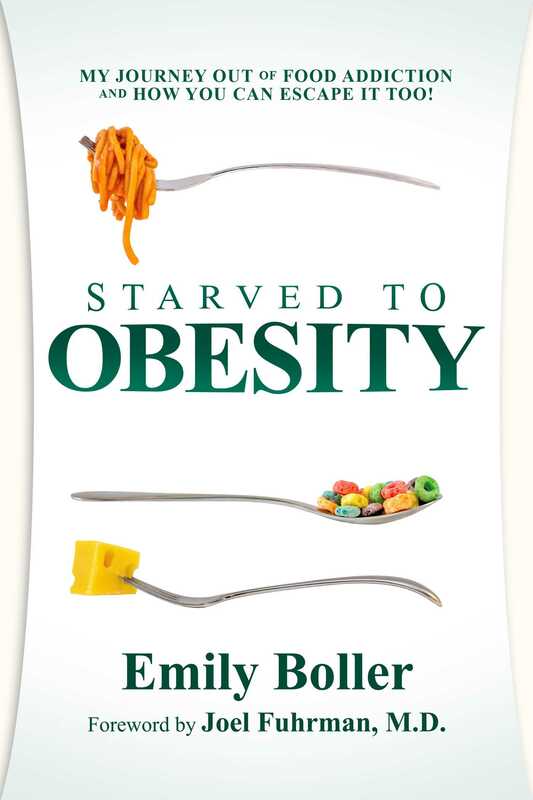 "In Starved to Obesity, Emily Boller bravely shares her inspiring journey out of despair after stunning life tragedies left her drained of direction and trapped in a fortress of fat from out-of-control eating. Candidly, lovingly, with nutritional pearls a-plenty, Emily shares her hard-won wisdom and practical advice for overcoming adversity and making delicious, health-promoting dishes that can help you transform the direction of your life to one of health and rich enjoyment of every day and every meal. I will recommend this wonderful book to all of my patients struggling with weight, food addictions and, emotional challenges of many kinds. Thank you, Emily, for Starved to Obesity - it is a gift to us all." "We are facing an epidemic of obesity and Type 2 diabetes with its acute, chronic, debilitating, deadly diseases. Fast food and sugars are horribly addictive. This book completely describes the problem and gives a solution. A great book! I would recommend it to everyone." "Emily Boller is an inspiration to everyone who knows her. As a formerly obese mother of five children, she is living proof that you, too, can finally overcome your battle with food. Starved to Obesity will not only teach you how to do it, but it will also leave you feeling Emily's warmth and understanding that you are not alone. It's time to be set free." – Sarah Taylor, MBA, M.S., "Vegan in 30 Days"
"Emily Boller's writings and presentations are engaging, authentic, and applicable for today's culture. Her insights are the result of experiencing devastating loss and triumphal victory along her journey towards a healthy lifestyle." "Emily Boller is a great example of identifying and gaining victory over some monumental issues in her life. She has embodied the theme of 'Not Somehow, But Triumphantly.'" "I loved Starved to Obesity! It was raw, liberating, and empowering... offering hope and inspiration for anyone seeking to embrace a healthy lifestyle." "The truth in this life-giving book will set you free. Thank you, Emily, for your vulnerability, wisdom and grace." "Emily Boller has faced her own eating challenges with unflinching honesty, unfailing open-mindedness, and unflagging persistence." "Starved to Obesity gives us a compelling insight into the fundamental reasons behind food addiction and binge eating. Growing up with a mother whose love language was cooking and baking, to the terrible tragedy of losing her son; food became Emily's refuge. Ironically, turning to food (the right kind) was the solution to attaining her optimal weight. Starved to Obesity offers a science-supported, practical guide to finding a healthy relationship with food. It's well researched and wide reaching. If you struggle with your weight and want to learn from someone who has 'been there, done that,' this is the book for you." – Dr. David Friedman, Syndicated TV/Radio Health expert and #1 International best-selling author of "Food Sanity: How to Eat in a World of Fads and Fiction"